This flash tutorial will teach you about dynamic masking. Dynamic masking allows you to use movie clips as masks. 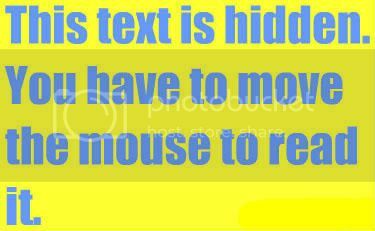 For example in this tutorial text will appear as the mouse moves over the screen. Masks basically reveal sections of the layer below it. This requires a mask layer which is the mask/movie clip which reveals the layers below. The layers below the mask layer are called the masked layer. Open a new lash document and set an appropriate stage size. Using the rectangle tool (r) with no stroke, drag a rectangle shape the same size as the stage. And then choose a colour to fill the rectangle. I used a yellow colour but you can choose whatever you wish. Name layer 1 “Bg”. This is now the background layer for your dynamic masking. On the timeline insert a new layer called “maskedbg”. This is layer is where the text movie clip will be placed. On the time line insert a new layer called “mask”. This layer acts as the mask layer where a movie clip object reveals the layers below. 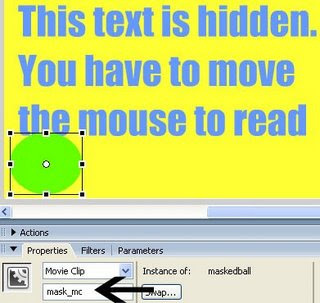 **SetMask method make the movie clip in the parameter mask_mc (circle object) reveal the movie clip maskedbg_mc (text message). Test the movie clip Ctrl + enter. And move your mouse over the screen. You should now have a dynamic mask. To make your dynamic mask draggable checkout the draggable dynamic mask tutorial.